I'm a firm believer in the proposition that the Immortal Hulk is Marvel's strongest current ongoing series. And yet, my luck hasn't been so hot when I've reviewed individual issues of it. I seem to keep hitting the (only comparatively) weak links. Today my streak is broken! I'm reading IH #14, the Betty Ross issue, and it is glorious. It starts with Thunderbolt Ross's funeral, and Betty carries the point of view to a terrifically eventful meeting with Bruce. Her story is relieved along the way by little snatches of foreshadowing and antagonism projecting out of Shadow Base like, well, creeping shadows. It's a remarkable portrait of Betty; she proves more than capable of sustaining our interest on her own. The script skillfully mines her complex backstory to paint a picture of a character who's been subjected to just as much absurd melodrama as her husband. This issue also does a lot of remarkable portraiture in a purely visual sense. Once again, the writer has done a magical job of adapting his script to suit the strengths of a guest artist. This issue asks Kyle Hotz to draw lots of tortured, expressive faces. His performance here proves that this is the comics equivalent of asking LeBron James to make crazy passes. The emotional faces are so well done that I nearly overlooked the incredible atmospheric work that conjures up a pounding rainstorm for the funeral scene or the over-the-top muscularity of the Hulk. Like the monster in a good horror movie, he's rarely seen but always memorable. This is a visual feast any way you want to slice it. It's supported by astute colour work that leans heavily on shadows and muted tones. That doesn't mean that the colourist is taking it easy; cutaways to Shadow Base allow for wild mad science hues, and there are remarkable tricks played even in Betty's down-to-Earth scenes. The way Bruce is coloured in corpse-like purple until Betty reflects a more human palette onto him? Wow. Art, characterization, and continuity links are all at the very highest level. The final touch that makes this issue truly great is the exquisite balance of plot and pacing. Betty's re-introduction is so thorough and so satisfying that I nearly called this issue self-contained. In fact, it raises tons of questions that future issues will need to answer. This issue satisfies because it focuses with laser-like intensity on the thoughts that obviously consume Betty's mind right now. Her father is dead and her husband is alive. How does she feel about those developments and what should she do about them? Her feelings are addressed with remarkable insight, and her reactions have already bent the larger plot to a remarkable degree by the time this issue is over. 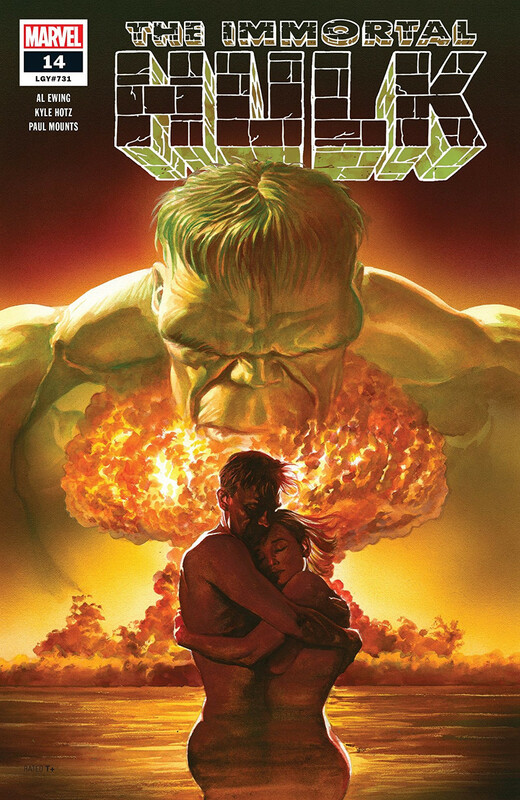 Incredible Hulk #14 is that rare comic that satisfies completely as both a part of a larger story and a story in itself. Tormented art (in the best possible sense), powerful characterization, and meaningful plot development: This one has it all. It's another tour de force of superhero horror and an unmissable installment in a title that rates mighty high on unmissability. Just the unwritten volumes of emotion packed into the faces at the funeral give me the shivers.